Peterhof (in the second half of 20th century known also as Petrodvorets - "Peter's Palace") - one of the most magnificent European palace-and-park complexes of XVIII-XIX centuries is situated on the southern coast of the Gulf of Finland, twenty-nine kilometers outside St. Petersburg. Its beautiful gardens and parks, splendid palaces and exquisite pavilions, and particularly its picturesque fountains and cascades, are justly famous all over the world. The marble obelisk standing near the railing of the Upper Gardens bears the incised number: 29. It marks the distance, in kilometers, between St. Petersburg and the splendid Peterhof, formerly a suburban residence of the Russian Emperors and now the world-famous "capital of fountains". Visitors approaching Peterhof from the sea can enjoy a majestic panorama unfolding before them. The most prominent landmark is the Great Palace towering at the edge of a natural, 16 metre-high terrace. Great Cascade is glistening with its gilded sculpture and silvery water-jets. 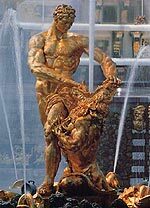 In the centre of the pool, in front of the cascade, a powerful jet of the Samson Fountain is spurting upwards. Further on, water is streaming towards the gulf along the Sea Canal, which is straight as an arrow and makes up the north-south axis of the layout of the site. The canal was indicated already on the first plans of the residence sketched by Peter the Great himself and is one of the earliest structures in Peterhof. Its construction began in 1715 simultaneously with the building of the Upper Mansion. The canal was then used as a transportation artery and a formal entrance to Peterhof. But already in 1735 the Samson Fountain was being constructed in the centre of the pool and the owner had to give up the former use of the canal. Peter the Great planned to build along the Sea Canal 22 fountains decorated with sculptures based on subjects from Aesop's fables. Later it was decided to remake fountains in the shape of bowls. In 1854-60 the worn-out bowls were removed and fourteen fountain basins remained on their sites. Now their powerful jets make up a majestic crystal-like colonnade leading to the Great Cascade. Faced with granite and decorated with gilded mascarons, the Sea Canal is one of the most spectacular sights of Peterhof, emphasizing the geographic and artistic integrity of the seashore residence with the watery expanse around it. The canal divides the Lower Park, which occupies an area of 102 hectares, into two parts named conventionally the western and eastern sections. In the eastern section are the fountains of the Palace of Monplaisir and the Chessboard Hill Cascade, the Pyramid, the Sun and the Roman Fountains as well as some trick fountains. In the eastern section are the fountains of the Hermitage Pavilion and the Marly Palace, the Golden Hill Cascade, the Menager or Economical Fountains and the cloche (bell) fountains. In summer 1721, under his command, sluices were built and a canal constructed to deliver water from the ponds on the Ropsha Hills to the storage reservoirs in the Upper Gardens. Their water could be used to bring into operation small fountains there. It was a different matter with the Lower Park lying at the foot of the terrace. Rushing down from the height of 16 metres through a system of pipes, the gravity-fed water from the Upper Gardens reservoirs spurted high upwards in the park fountains. The principles of water supply discovered by Peter the Great are still in use today, which testifies to the versatile talents of Peterhof's founder. Today, the Peterhof ensemble amounts over 150 fountains and four cascades. Every year hundreds of thousands tourists from all over the world visit this "capital of fountains" to enjoy the unforgettable miracle, as Peterhof has been regarded throughout its history. The Great Palace, the Monplaisir Palace, the Marly Palace, the Hermitage Palace, the Cottage Palace, Peter the I's Palace, the Grottos, the Benois Museum, the Catherine Block, the Bath House, the Chapel, the Upper Garden, the Lower Park, the Alexandria Park. On the territory of Museum-Reserve there are about 150 fountains, including 4 cascades: the Great Cascade, the Chessboard Hill Cascade, the Golden Hill Cascade, and the Lion Cascade.